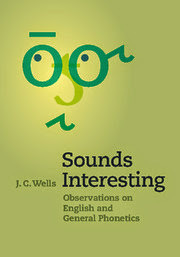 John Wells’s phonetic blog: now in book form! Wonderful, John! I'm very happy to hear from you again. Nice to hear from you, John. I shall order a copy. I'm looking forward to reading about charted/chartered. I'm not sure whether they are homophones for me. "Charted" would definitely be /tʃa:təd/. In "Chartered", the second vowel might be slightly longer (especially if I'm stressing the word) and I'm not sure whether it belongs with my /ə/ or my NURSE vowel. The dilemma is whether to give [əˑ] to /ə/ or to /ə:/? That is cool to hear that,i am so glad to book it. I am a Phonetics teacher from Buenos Aires, Argentina. At present I am teaching segmental and suprasegmental Phonology at IES en Lenguas Vivas Juan R. Fernandez. Recently, I came into a copy of your latest book 'Sounds Interesting' and was delighted with all the points you made there. In fact, reading about the tutonic rule reminded me one of my professors, Nilda Zenobi, from whom I had learnt about the rule for the first time in my life, and being colleagues,now, I often consult on stress and other phonetic features . Therefore, I decided to show her your latest book. She was pleasantly suprised to see you work with the tutonic rule since Nilda has worked and works a lot on this field. Incidentally, on one occasion, we discussed the word 'integrative'. among others, and inferred that most three syllable words keep the stress on the first syllable as their derivative root word. But this inference does not always work like this. I would be grateful if you could tell me your opinion about it.